Pool maintenance doesn’t end when the temperatures hit freezing. In fact, in order to keep your Quality of Ownership score (QScore) in good standing, it’s important to give your pool some TLC all year long. 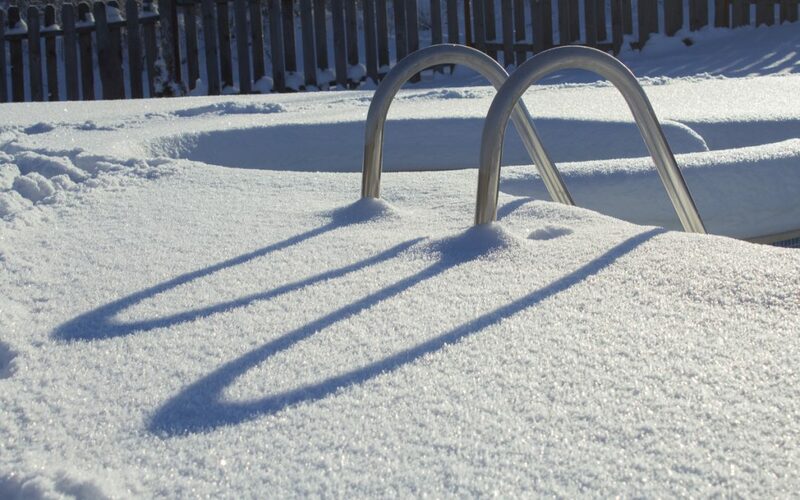 Here are nine winter pool care tips to take into consideration during the off-season. If you do not have a pool with in-floor cleaning and circulation system, or a pool with freeze protection, or you live in an area that winters are too long and too cold for freeze protection to work, then you will want to take additional steps to prevent your pool’s pipes and motorized parts from freezing. In order to do that, you must drain all of the water from the pump, filter, and heater before winter hits. Always drain the pool water about four to six inches below the skimmer as well so water doesn’t enter it and freeze. If your pool’s pipes freeze, it could lead to expensive damage that will require repair as soon as possible. In extremely cold climates, you can add an additional layer of protection by using swimming pool antifreeze. When you close your pool, always add a long-lasting algae preventative such as an algaecide or algaestat. It’s easier to prevent algae from growing rather than cleaning up the problem. Add algaecide the day before closing your pool up for winter. Then, make sure it circulates properly by running the pump for 24 hours. Most algaecides will last for 90 days. Pool owners should invest in a pool safety cover. These are designed to allow rainwater to seep in, while dirt and debris simply blow away. It also makes the swimming pool area safer for children and pets as it’s flush with the ground. Most pool covers can be easily cleaned by hosing off any dirt on a regular basis. In addition, make sure the cover fits properly. This will keep all of the unwanted dirt, debris and melting ice out of the swimming pool. When you add your algaecide, be sure to add chlorine to it in order to properly close your pool. Use caution when doing this as too much chlorine can bleach your pool cover. In the spring, open a corner of your pool cover and add one to two gallons of liquid chlorine to the pool. This will ensure a clean opening come summertime. Measure the size of the pool. Include the top rails in your measurements. Take into consideration how low you will drop the water level. Most pool covers will come with enough material to compensate for a water level that is reduced up to 12″. Review the cover size labeled on the package. Two sizes will usually be displayed, the pool size and cover size. If you’ve experienced heavy rainfall in your location and have a mesh safety cover, your pool water is likely diluted. Add more chemicals to ensure algae doesn’t bloom before spring. Non-organic contaminants can seep through a mesh safety cover in the winter. One of the best ways to battle this is to use an enzyme product to break it down. The product can typically be poured into the pool water through the mesh cover. The enzyme can also get rid of a dirty waterline mark to save you from heavy cleaning when you open your pool. An above ground pool cover can slowly fall into the pool as the cables loosen. Consider using an air pillow in the middle of the pool. This will protect the pool from weather damage and will also push debris and water to the sides making it easier to clean. You don’t have to wait until the water is warm enough to swim in before opening your pool. By opening your pool early, you can prevent biofilm and algae from growing. Late in the spring, the water is warm and dark enough that bacteria and fungi can start to grow out of control. By opening your pool early and using an algaecide over the winter, opening your pool will generally be easier and you have a better chance of having a clear and clean pool. Why Is a “Quality of Ownership” Score Important? Not only is it important to take care of your pool during the winter to keep it in good condition for use, but it’s also important when it comes to your Quality of Ownership score. A Quality of Ownership score is crucial when it comes to selling your home, or purchasing a new home, with an inground swimming pool. This score reflects how well the pool has been taken care of and offers a home buyer peace of mind when it comes to their investment. Whether you’re buying a home with a pool, selling a home with a pool, or are just a pool owner, sign up to register your pool for free in the POOLFAX database.